We get it. It’s difficult sometimes to understand how big a bouncer is. Especially if it’s your first time renting one. You visit a ton different sites and browse through hundreds of bouncers and after hours of searching you’ve narrowed it down to two or three that you think would be best for your event. Sometimes that decision is tough, especially when it comes down to two similar units such as the ones below. This past summer, we have taken special note of our customers’ decisions and feedback and this post is about to do some myth busting. Two of our most popular units are the 5-in-1 Themed Combo and the 6-in-1 Themed Combo. There is a pricing difference between these titans. Naturally one would think that the 6-in-1 themed combo would be the larger and higher priced. It turns out that the opposite is the truth. 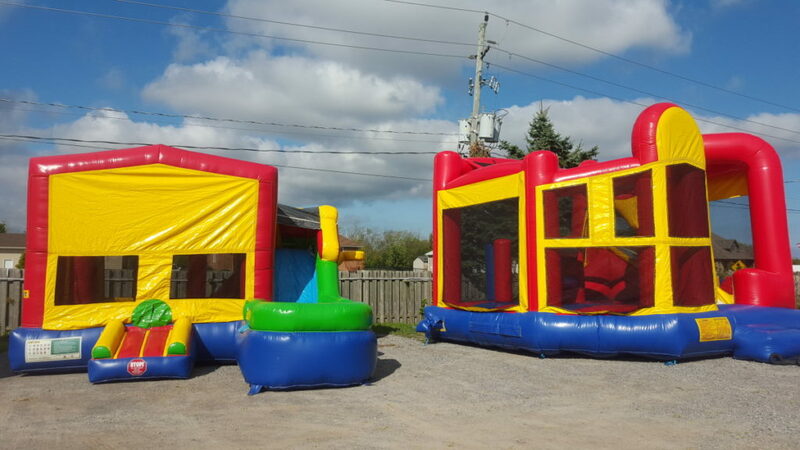 On the left we have the 6-in-1 Themed Bouncer and on the Right the 5-in-1 Themed Bouncer. The 5-in-1 Themed Combo is larger in all regards. It has a larger slide, more bouncing surface and higher ceilings when compared to the 6-in-1. The 5-in-1 is priced accordingly for this difference. With the 5-in-1 you definitely get more ‘bounce for your buck’. What the 6-in-1 Themed Combo does offer is more activity in a relatively small amount of space. You could say it’s dense with fun and still a great option while on a budget. In the photo, you can see the 5 and 6 side by side. It’s clear that numbers don’t always matter, but size does. Check on availability for either of these bouncer and request a quote by clicking BOOK NOW on the top left of this page.